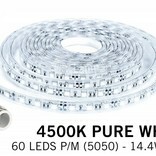 Waterproof IP68 LED Strip Natural White (4500K) LED strip with 300 LEDs. SMD 5050 IP68 fully waterproof, 12 volt, 5 meters. Waterproof pure natural white LED strip with 300 LEDs. IP68 stands for completely waterproof. 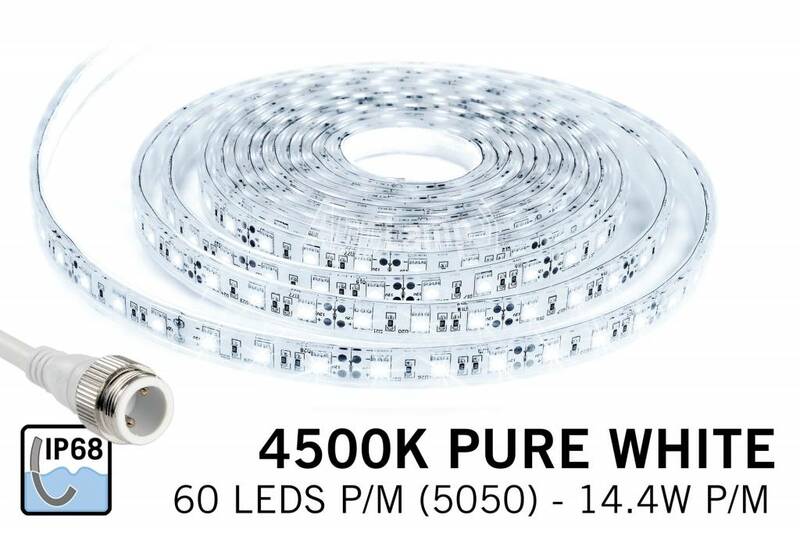 This waterproof white LED strip is rain resistant, and can for example also be used underwater in pond, pool, hot tub or an aquarium with underwater LED lighting. The bright white color creates a sparkling effect outdoors: The pure white tint ensures natural color reproduction for an eye catching outside or underwater environment. 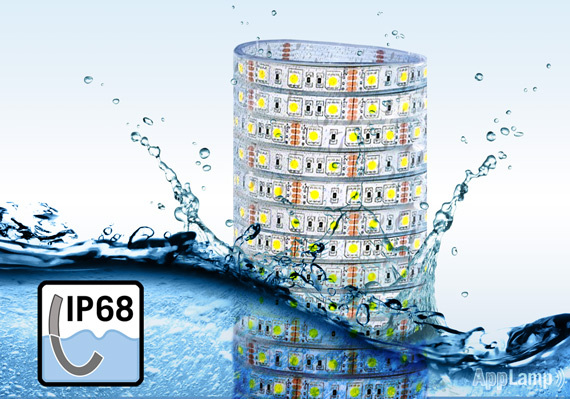 This versatile IP68 flexible strip contains A-quality LEDs and have a high quality silicone casing. 22 lumens of bright SMD 5050 LEDs provide a sea of light. The waterproof white LED strip can be shortened every 5cm. Look for accessories, such as extension cables, terminal connectors, additional sealing end caps with silicone and mounting clips to the category "LED strip accessories" or at the related waterproof products below. This waterproof LED strip with 60 white LED's per meter has a length of 5 meter.